The trip down the tunnel is a blur of sound; Rabbit struggling and Frog squirming in my pocket. The way I’m being dragged, my coat is bunched up, trapping Frog in the folds. My hat id pushed halfway down my eyes so I don’t get the full force of the light when we reach it but when we do, the hard grip loosens and I tumble to the floor. Frog hops out and lands on my knee and Rabbit runs for the nearest hiding place. “What were you doing outside my house?” I can hardly make out the words with so many scarves over the mouth in the shadowed face above me. The shadow starts pulling off clothes till a face is finally revealed from under a hood, a hat, and two scarves. The olive colored skin still blushes form the cold. I expected Marsalla to be a scary old lady from the way people talk and how she was hunched over. But the pumps on her back where the overlap of the scarves and the packages strapped under her coats. Her face is round and she looks younger than Auntie. A smile makes her cheeks round and Marsalla tosses her coat on top of a growing pile of outerwear. “Well, any friend of Frog’s and blah, blah, blah.” Marsalla rolls her shoulder so her bag slips off, a long fingered hand catching it before it can hit the floor. Her teeth are small, straight, and very human, smooth skin and hat hair all say normal lady just come back from the cold. How is she a witch? Marsalla’s blue eyes light up. “Rabbit?” She darts off to where Frog is shouting and snatches up Rabbit with a quickness I didn’t think a woman of her size could do. Auntie is all bones and can’t move that fast but Marsalla is all curves and moves like lightening. Some of her baby talk is muffled as I pull off my coat and look around. Books and picture frames and mirrors are everywhere, the only bare spots on any flat surface clean from a fresh dusting.. The carpet stops in front of the kitchen and a wide circle around a fireplace as big as Auntie’s dogs. Once my coat is off, I notice how warm it is; my heart stops pounding and I notice the room smells like soft incense. “Marsalla, you’re smothering her with your mammal parts.” Frog teases and I giggle when I see Rabbit’s baffled expression as she’s snuggled ruthlessly into the front of the woman’s sweater. “Are you sure we’re in the right place?” I disobey every rule about staring at people, my mouth open in disbelief. “You lookin’ for the witch who lives in this big, scary house?” Marsalla says. I shouldn’t have told Auntie. “Your mother would bore me to tears with such nonsense. Don’t you mention it again.” She was so mad, I thought she would hit me. But she hasn’t done that in years. I’m a really good girl now. Except that I talk to animals. Who talk back. Even if Auntie hates it, I promise myself I’ll look for Rabbit and Frog again today. If my Mother could do this, too, she’s given me a great gift. When I bring scraps out this time, they’re waiting for me, Frog on Rabbit’s back on top of the frozen snow. I try to bring something that’s still warm but the toast crusts and stew veggies are nearly cold by the time I reach them. “If you got time, kid, we’ll show you.” Rabbit flicks her ears to shake Frog off as she bites into some carrots. “So let her be mad.” Frog smiles at me and it’s a little scary with no teeth. He’s right. Auntie is always mad. The lake isn’t too far and Auntie went to bed hours ago. The dogs would never scratch at the door loud enough to wake her, the fires are all down, and all the food is put away. I’ve got on plenty of warm clothes so I won’t freeze and I know to be careful around the lake. It’s frozen real firm but I could still fall and break a bone. If I hurry, I could see this someone and be back before Auntie ever knew. Following a rabbit with a frog on her back is much harder than two high-strung dogs. Auntie’s dogs couldn’t hide in the snow if their lives depended on it, insisting on bounding though the drifts like they were wrecking balls. Fur and snow would fly everywhere, telegraphing where they are. Rabbit may be brown but she slips smoothly into the piles of snow and I can’t find where she’s gone till she pops back up again. It’s like a game of whack a mole. Only no whacking. Just like the game, it’s fun to watch. 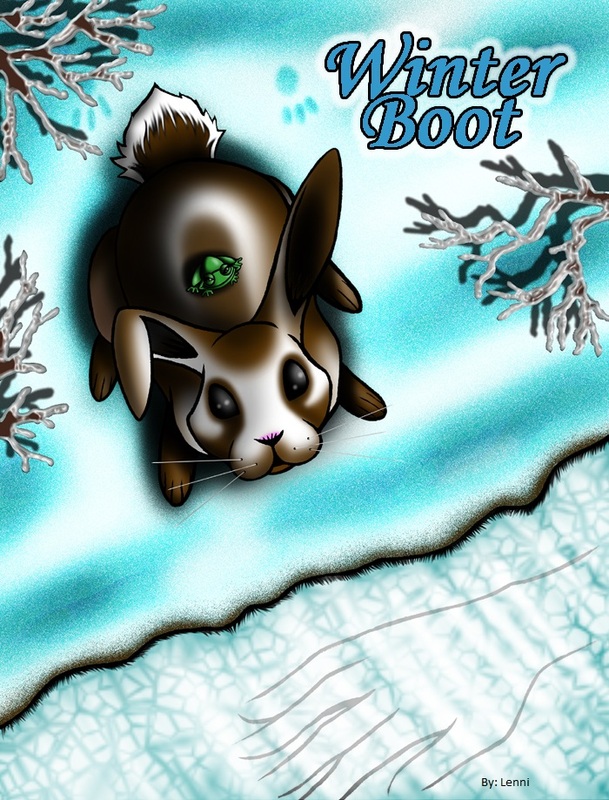 Rabbit dives into the icy powder with an energetic puff and comes up with a burst of glittering flakes. Each time, I’m able to catch up a few steps. All those walks with the dogs prove to be good practice in keeping sure feet on the slippery snow. The twisted, frost covered trees come into view first, frozen in stasis by a motionless river. The only life here is myself, a frog, and an impatient rabbit tapping on the riverbank. The fish either froze or escaped to warmer waters. “Ok.” I put Frog in my pocket where he’ll be safe and crawl to where he pointed. The ice is solid, not making a single creek, but I’m more worried about slipping on it than falling through it. The snow sticks to my mittens as I brush the ice clean and I see the face of a man. His skin isn’t blue like you’d expect a frozen man to be. Even with the ice reflecting blue all around him, his face is bright and healthy under the motionless water. I expect him to blink up at me and tell me little girls shouldn’t play on the ice just like any other adult. And he’s got my face. Just like Frog said. “Marsalla might know. None of the animals can remember; even the ones who remember Summer.” Frog croaked from my pocket. I nod and crawl to land before I stand up. I feel colder now and run fast to warm myself up. All I can think of is how to get to this Marsalla without Auntie knowing about it.